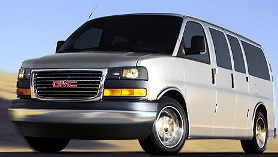 Private 6-Hour 15-Passenger Van Sightseeing Tours — A great way to see New York City. Enjoy the high-quality private tour you would expect from OnBoard Tours, but in the comfort of a smaller van. * Professional, licensed Tour Guide and van driver will accompany your private tour. * Choose your own times. * Manhattan Hotel pick-up and drop-off included in price. Call or email us to get pricing and availability information. Call 1-212-852-4821 or (877) U-TOUR-NY to book today! Private 4-Hour VIP Tours — The luxurious way to see New York City. Enjoy the high-quality private tour you would expect from OnBoard Tours, but in the comfort of a luxury SUV or Limousine. * Professional, licensed Tour Guide and driver will accompany you at all times. * Choose your own start and end times. * Speak with your tour guide before the tour to plan it. * Let us know what beverages you want on the tour. * Incorporate a lunch or dinner break in the tour. * Amend itinerary anyway you wish. Contact us for pricing and availability of Private VIP Tours. Private 6-Hour Shuttle Sightseeing Tours Tour New York City aboard your own private shuttle with a licensed, professional NYC Tour Guide. You can choose your own times for your tour as well as amend the tour itinerary any way you wish. Our Tour Guides will contact you a few days prior to your tour date to discuss any changes or special requests you may have. Free refreshments provided (bottled water and cokes). Hotel pick-up and drop-off included in price. Call or email us for pricing and availability information. Private Walking Tours A great way to see New York City as New Yorkers really see it. Private Walking tours are great in that you can easily stop by into a store or to browse or even quickly pick something up without having to stop or park the tour vehicle. OnBoard New York walking tours come with a professional, licensed NYC Tour Guide and a free subway one-day pass. You are free to amend the tour itinerary anyway you wish and as always our Tour Guides will contact you a few days prior to discuss your tour with you. Our walking itineraries are great and effectively use the subway system to preserve your energy throughout the tour. * Airport pickup available: Provided that your private tour is the same day as your flight, we can pick you up at the airport and take you to your hotel to drop off your stuff and then start the tour from there. It’s a convenient way to start your tour.